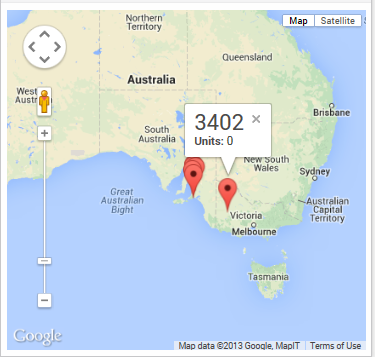 Displaying a Google map with markers and values – How can we help you today? You can use the HTML Template component to display a Google map with markers and values specified in a data source. Click Build a New Klip and select the HTML Template component. Select Use an existing data source file and upload the required data source file. Select the Klip component and type a Klip Title. Select the HTML Template component and proceed to Step 2. Assign data as follows (the SLICE function removes the row header from each column of the data source). Insert references to this information in the HTML Template. Copy and paste the following HTML into the HTML Template box on the Properties tab. Set Overflow to Auto scrollbars. Click Save and Name the Klip. Click Finished.